I stumbled across a drawing or two of Superman that made me take notice the other day. What do I like about these images? What do they remind me of? 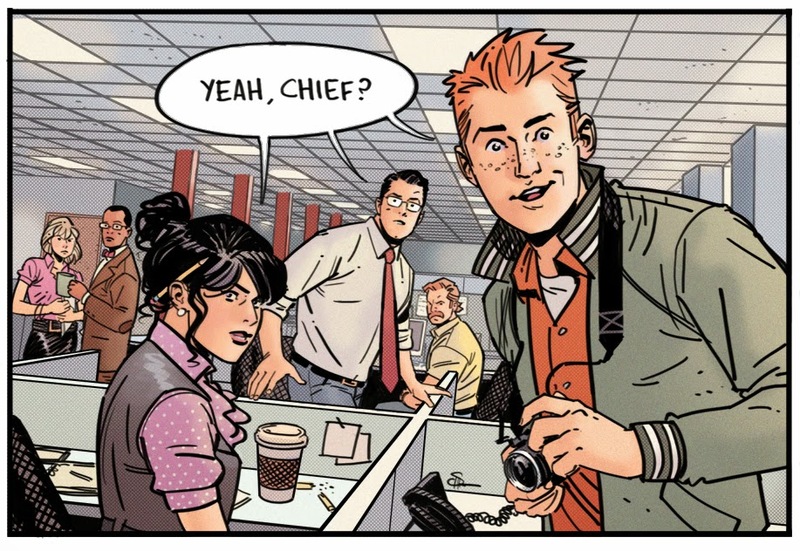 The modern edge of Chris Samnee, angularity reminiscent of Garcia Lopez, a line as bold as Alex Toth's. Nice. 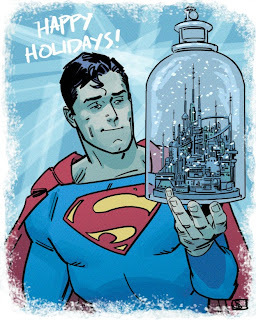 The artist is Evan (Doc) Shaner, who will be drawing some Superman stories in the near future. I look forward to seeing much more from the gentleman! Sean Howe (author of Marvel Comics: The Untold Story) has uncovered a 1966 audio tape of Stan Lee speaking at Princeton University. I first enjoyed seeing Mr. Lee on a stage at the first Chicago Comicon in 1976 but, of course, 1966 was a lifetime or two before 1976. In this recording Jack Kirby gets a couple of nice mentions and there are boos when Stan announces that Steve Ditko is leaving Spider-Man. The audio is challenging in places but your patience will pay dividends. As I write this the youtube clip has just 143 views but I expect that count will rise dramatically in short order. You can add one to that count by going right over here. Nice job, Mark Dos Santos! 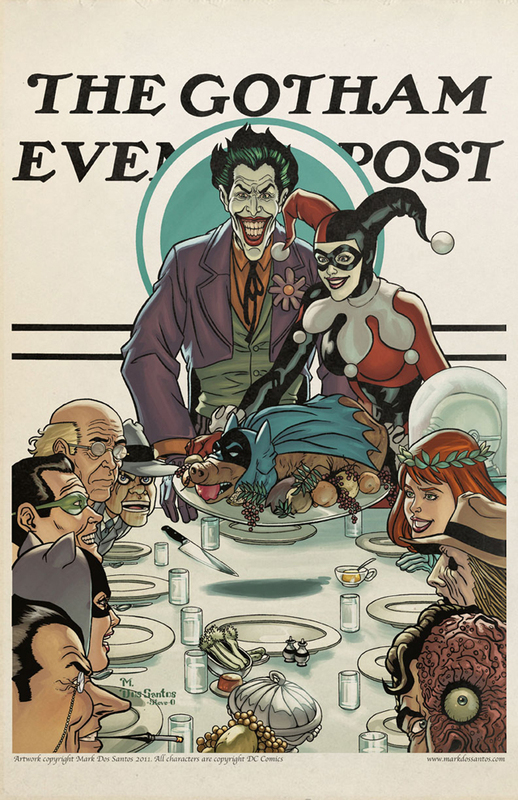 The gentleman has tapped into a Norman Rockwell vibe with spectacular results. 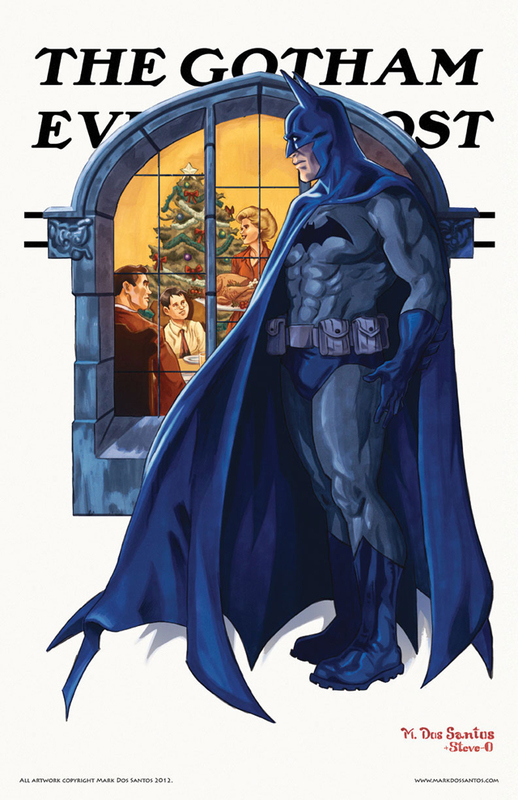 I'm focusing here on a couple of his Batman-related works, but Mr. Dos Santos (an alumnus of The Joe Kubert School) does just as nice a job with the worlds of Sandman and X-Men and Doctor Who. See for yourself over here on the artist's website. 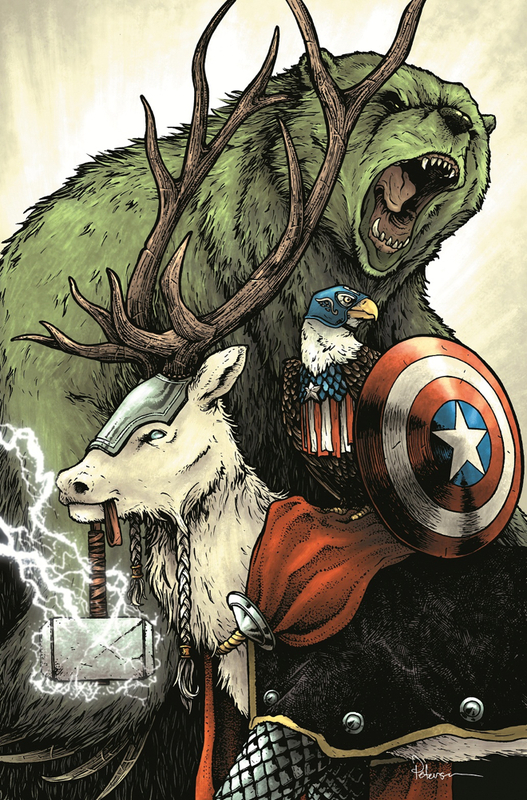 Marvel Comics is releasing a bunch of their comics with variant covers that show the characters as animals. 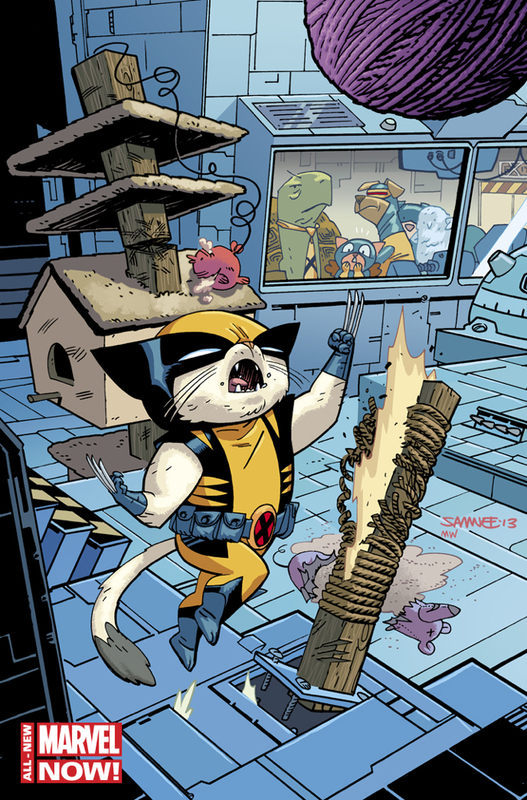 Enjoy Chris Samnee's Wolverine Kitty in the Danger Room down below, and you can see a dozen or two more drawings in this same vein over at the (?) Wired Magazine website. You can order a print over here from artist J.K. Woodward. When Mick told me on the phone that he was growing a beard I didn't know what I'd be seeing, but never in one TRILLION years did I expect Wolverine! Move over Hugh Jackman. Rich Buckler was drawing comics wall to wall back in the 1970s and I remain very fond of his work. 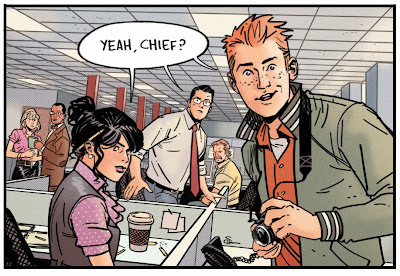 I used to own a number of pages of his excellent artwork and I'll show them to you a different day but, for now, I want to bring you up to date on what the gentleman is doing now that he's not drawing for comics anymore. He paints! I stumbled upon Mr. Buckler's website when researching a different matter and I knew I had to share what I had found. A couple of the paintings are shown on this page and you can see many more over at www.richbuckler.com. Back in the 1970s, Keith Giffen drew a string of Kamandi issues after Jack Kirby left the title and some of those issues were inked by Mike Royer. I remember liking that artwork as it was published and I have always wanted to own one of those Giffen/Royer pages. I decided while writing the preceding paragraphs to look up exactly how many of those 1970s Kamandi issues were drawn by the Giffen/Royer team, and the answer surprised me. One! One issue! Kamandi #44 from August 1976 was the one and only, and just eleven pages were devoted to the Kamandi story because there was a Tales of the Great Disaster backup. This accounts for why I've had such difficulty finding one of those pages, but I will keep looking. That's the fun of collecting.